The Birger Figurine wears a skirt with a rolled waist or belt. It was created sometime between 1100-1200 A.D. Her left hand rests on the head of a great mythical serpent, while her right hand tills the back of the creature with a hoe. Cahokia female flint clay figurines represent underworld religious themes: regeneration, world renewal and fertility. Photo provided by the Illinois State Archaeological Survey. 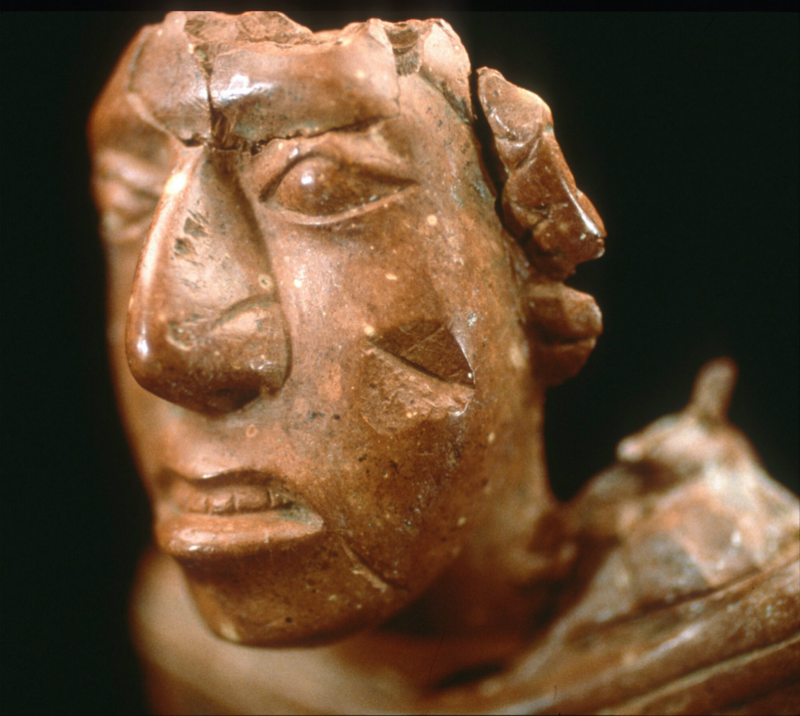 The exhibit “Cahokia’s Religion: The Art of Red Goddesses, Black Drink and the Underworld” is on display at the Spurlock Museum of World Cultures at Illinois. Created in cooperation with the Illinois State Archaeological Survey, the exhibit features objects from the ancient city of Cahokia, which was located near what is now Collinsville, Illinois, as well as objects from surrounding areas. In the fertile floodplain of the Mississippi River, 10,000 to 20,000 people built and lived at Cahokia from 1050 to 1200 A.D. Another 20,000 to 30,000 people occupied the surrounding farmlands and smaller ceremonial precincts in the region. This great center of human activity, the first city in North America, affected people across the Midwest and Southeast. The objects in the exhibit demonstrate the skills and perspectives of this civilization’s artists, farmers, priests and leaders, and include well-known artifacts such as the Birger Figurine, a female figure made with flint clay, a soft rock found only in the Ozark Highlands near St. Louis. Some experts interpret the figurine as Earthmother, the mythological mother of all humans and vegetation. She is a symbol of the cycle of life and is also known as Our Grandmother and Old-Woman-Who-Never-Dies. The exhibit runs through May 20 at the museum, 600 S. Gregory St., Urbana. Admission is free and the museum is open Tuesday from noon to 5 p.m.; Wednesday, Thursday and Friday from 9 a.m. to 5 p.m.; Saturday from 10 a.m. to 4 pm. ; and Sunday from noon to 4 p.m.
On April 27, the conference Ancient Cahokia Future Visions celebrates 150 years of research at the U. of I. by bringing together world-renowned scholars, advocates and dignitaries to discuss Cahokia. Learn more at the conference website. A behind-the-scenes look at the exhibit has more information.